The constellation of eight CYGNSS microsatellites reached a milestone today, completing its second year on-orbit. The first year had focused primarily on engineering commissioning, calibration and early validation of the science data products. The second year was spent continuing to refine and improve the quality of the science data products, while also applying the measurements to a number of scientific investigations. Some examples of the refined wind speed measurements are shown below for three overpasses of Hurricane Maria, on 23 Sep 2017 at 00:18 (top), 23 Sep 2017 at 00:23 (mid), and 24 Sep 2017 at 00:18 (bot). In the figure, the green trace shows the measurements made by CYGNSS while the blue trace shows measurements made by SFMR instruments on the NOAA hurricane hunter aircraft that flew into the storms while CYGNSS was passing overhead. The CYGNSS and SFMR measurements can be seen to agree quite well. Quantitative results of the calibration and validation of CYGNSS science data products are described in a Special Issue of the IEEE Journal of Selected Topics in Applied Earth Observations and Remote Sensing. 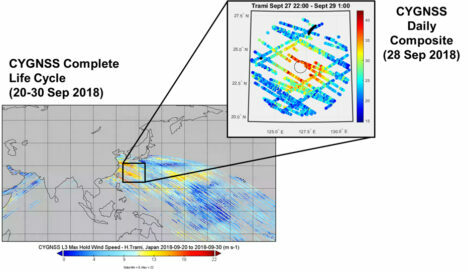 Measurements by CYGNSS of Typhoon Trami in Sep 2018, shown below, illustrate its ability to track the evolution of a storm over its full life cycle. 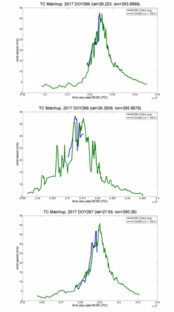 In the figure, the lower left image is a composite over the period 20-30 Sep 2018 of all wind speed measurements made at one phase of the constellation’s orbit. The upper right insert shows all measurements made on 28 Sep 2018, with the measurements re-gridded to a storm-centric coordinate system to illustrate the wind speed structure in the inner core region. Science investigations have expanded beyond the primary mission objective to measure wind speed in tropical cyclones. The measurements are being introduced into numerical weather prediction models to assess their impact on the skill in forecasting hurricane track, intensity and structure. Early results look quite promising, with clear signs of a positive impact on forecast skill. The results will be presented in a series of talks at the annual meeting of the American Meteorological Society in January 2019. In parallel with the activity over ocean, new science investigations are examining data over land as well. CYGNSS measurements have been found to be sensitive to the surface soil moisture, and to the presence of inland water bodies. Good examples of this are documented in recent publications. Kim and Lakshmi (2018) [doi:10.1029/2018GL078923] estimate soil moisture at numerous sites in the continental U.S. over a 12 month period and find close agreement with independent measurements made by ground sensors and another satellite. Jensen et al. (2018) [doi:10.3390/RS10091431] demonstrate the ability of CYGNSS to detect and map the extent of flood inundation under dense forest canopies. Chew et al. (2018) [doi:10.1038/S41598-018-27673-3] use this capability to produce time lapse images of flooding in and around Houston and Havana after landfalls by Hurricanes Maria and Irma, respectively. These results demonstrate the wide range of future applications of CYGNSS data as the mission moves forward into its third year. This entry was posted on Saturday, December 15th, 2018 at 6:03 pm and is filed under Cyclone Global Navigation Satellite System (CYGNSS). You can follow any responses to this entry through the RSS 2.0 feed. You can skip to the end and leave a response. Pinging is currently not allowed.